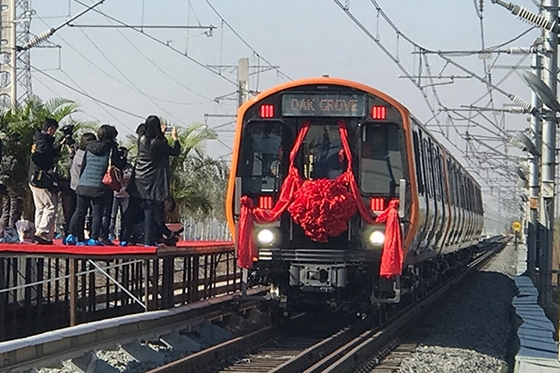 The first China-made subway cars tailored for Boston's orange line rolled off the production line Monday in Changchun, capital of northeast China's Jilin Province. The subway cars, which will be delivered to the United States in December, are among a 284-carriage order signed by CRRC Changchun Railway Vehicles and Massachusetts Bay Transportation Authority (MBTA) in December 2014. "With completely independent intellectual property rights, China-made subway cars have met U.S. standards in terms of control security, quality management and vehicle strength," said Yu Qingsong, deputy chief engineer of CRRC Changchun. The subway cars have adopted high anti-collision standards, which ensure passenger safety in case of trains colliding at a speed of 40 kilometers per hour, Yu said. "These 'next-generation vehicles' will be the backbone of our heavy rail fleet for many years to come," said Jerry Polcari, chief procurement officer for the MBTA. The U.S. rail transit market has strict requirements in terms of technology, localization, and law. The 2014 deal, intended for the orange and red lines of the Boston subway, was the first time a Chinese train car maker won a bid in the U.S. market. Parts of the subway cars will be produced in Springfield, Massachusetts, where a CRRC assembly factory was built in September 2015. Creating at least 150 jobs, the factory is expected to open 2018.